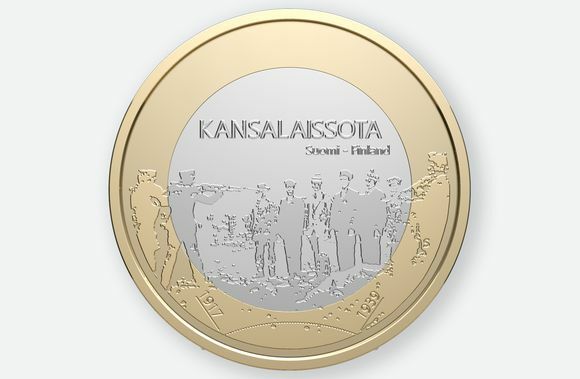 The Finnish Mint has withdrawn a commemorative coin depicting an execution scene from the Finnish civil war. Social media also took the moneymaker to task for using the now-viral image of a drowned refugee child on a coin meant to celebrate Finland’s independence centenary. It didn’t take long after the Mint of Finland began promoting a new box set of centennial commemorative coins before social media users began expressing their displeasure over the choice of themes for the five-piece series. The Mint divided the collection into five coins each celebrating two decades of Finland independence experience. The flap came in part over the first coin, marking independence from 1917 to 1939, which depicted a civil war execution scene and bearing the text "Civil War". It harked back to the country’s bloody 1918 conflict between the Soviet-backed Reds and the conservative whites. The events carved a deep division among Finns and remain a sensitive subject to this day. On its Instagram page, the Mint described the collection as a series "that tells the story of Finnish independence through its accomplishments and triumph over adversity." Social media users immediately weighed in, "How is it that such tasteless 'commemorative coins' are allowed? Hopefully someone feels shame and these are withdrawn. Geez. Sick," wrote one Instagram user. On Tuesday Finance Minister Petteri Orpo called on the Mint to retract the coin, whose imagery he said came as a surprise. "To my astonishment I discovered that the Mint of Finland had designed commemorative coins, on which there is what I see as a very tasteless picture. I don’t understand how it matches the spirit of Finland’s 100th anniversary – in any way at all. I actually hope that this coin will be withdrawn," Orpo said in Parliament Tuesday afternoon. "Finland is 100 years old, we are together, we are one nation. I simply don’t understand," Orpo declared. Orpo said that the Finance Ministry makes decisions about coining money, but images are determined by an artistic committee. Later, on Tuesday afternoon the money maker announced it would withdraw the coin, which had not yet been released. Orpo apologised for the incident, saying that he had not paid sufficient attention to the composition of the coin. According to the Finnish Mint, the commemorative coins are to be released in phases, with two pieces celebrating the first four decades of independence from 1917 to 1959 being published this year. Those coins depict the controversial execution imagery and Finland’s war children (sotalapset) a reference to roughly 70,000 Finnish children evacuated mostly to Sweden during World War II. Another pair of coins marking the decades from 1960 to 1999 will be released in 2018. A final coin celebrating independence in the decades since the turn of the millennium also raised eyebrows among Finns. That coin is headlined "Global Justice" and portrays the scene of a rescue worker holding the limp body of three year-old Alan Kurdi, a young Syrian refugee who drowned in the Mediterranean in September 2015 while trying to escape the ongoing civil conflict with his family. The image made global headlines, but many in Finland had a hard time reconciling the image with the Finnish independence centennial. "Finnish history in a nutshell. You really couldn’t come up with anything better? 'Global Justice' 'Civil War'. Ridiculous," wrote another Instagram user. The final coin in the series portraying the drowning of Alan Kurdi is to be issued in 2019.